There are a whole bunch of theorems in Riemannian geometry to the effect that “if the Riemannian manifold has property A of the curvature, then it has the topological property B.” Over the rest of MaBloWriMo and in the following weeks, I aim to talk about a few such results. The first one characterizes manifolds of negative curvature. Theorem 1 (Cartan-Hadamard) Let be a complete Riemannian manifold of negative curvature. Then for , the map is a covering map. In particular, if is simply connected, then it is diffeomorphic to . Of course, the diffeomorphism doesn’t have to preserve the Riemannian metric. Proposition 2 Let be a complete Riemannian manifold. Suppose and the map is an immersion. Then is a covering map. Theorem 3 (Ambrose) Let be a surjective morphisms of Riemannian manifolds with complete. Suppose preserves the metric on the tangent spaces. Then is a covering map. I will work backwards to prove these three results. The idea is to use exponential coordinates. Firstly takes geodesics to geodesics, at least locally. Indeed, if is a curve in , geodesics locally minimize length, and is locally an isomorphism of manifolds. By splitting a geodesic in into small pieces, it follows that maps geodesics in to a broken geodesic in , but since is smooth, just maps -geodesics to -geodesics. So let . We will find a small neighborhood of such that has components diffeomorphic to . Indeed, take an open star-shaped set containing mapped diffeomorphically onto some open set, say . If is taken very small and is chosen as , we can take to be if is the metric on induced by the Riemannian metric. Indeed, if , then because preserves curve lengths. This implies that the second set is contained in the first. The image in is , while by Hopf-Rinow II the image in is . 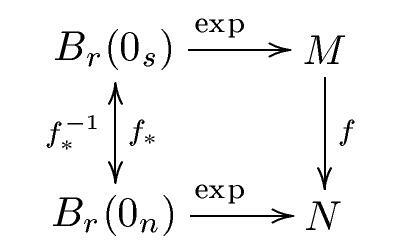 From the diagram it is even clear that is a diffeomorphism. If we can choose a geodesic between and which we can locally, piece-by-piece, lift it to a piecewise-smooth curve starting at and ending at some point of . Now is proportional to so is actually a geodesic (hence smooth) by these arguments. In particular, the length of is , and . This proves the other inclusion. So we have . Each is diffeomorphic to . All we need to show is that are disjoint for . Otherwise we could choose and choose geodesics from to in , and to in . The images give two different geodesics from to , contradiction. This proves Ambrose’s theorem. Since the map is surjective (H-R II) and an immersion by assumption, we can consider the pulled back metric on and apply Ambrose’s theorem to it. The only thing we have to check is that with the Riemannian metric on , it is complete. But geodesics through the origin exist of arbitrary length—they are just the straight lines through the origin, since these lines are mapped onto geodesics in . By H-R, this “completeness at a point” implies the completeness of the whole manifold. I will actually prove the Cartan-Hadamard theorem in the next post.